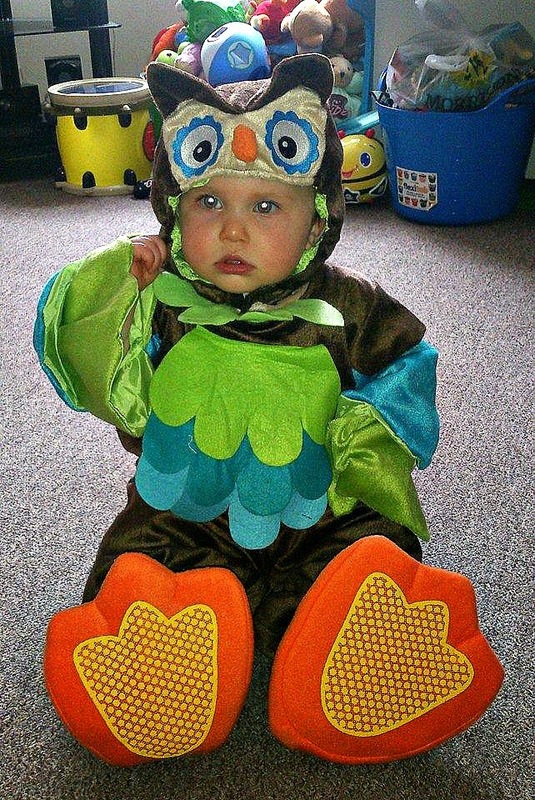 There is something so adorable about babies dressed up in cute costumes and lets face its there is only a short period of time we parents can get away with it before they start to say no! So when I was recently offered the opportunity to try out this SUPER cute owl costume from Time to dress up I simply couldn't resist! The costume arrived swiftly and well packaged, it was wrapped beautifully in dotty tissue paper and then inside its own handy plastic reusable bag inside. I found this bag to be perfect for keeping the outfit in when not in use to keep it safe. 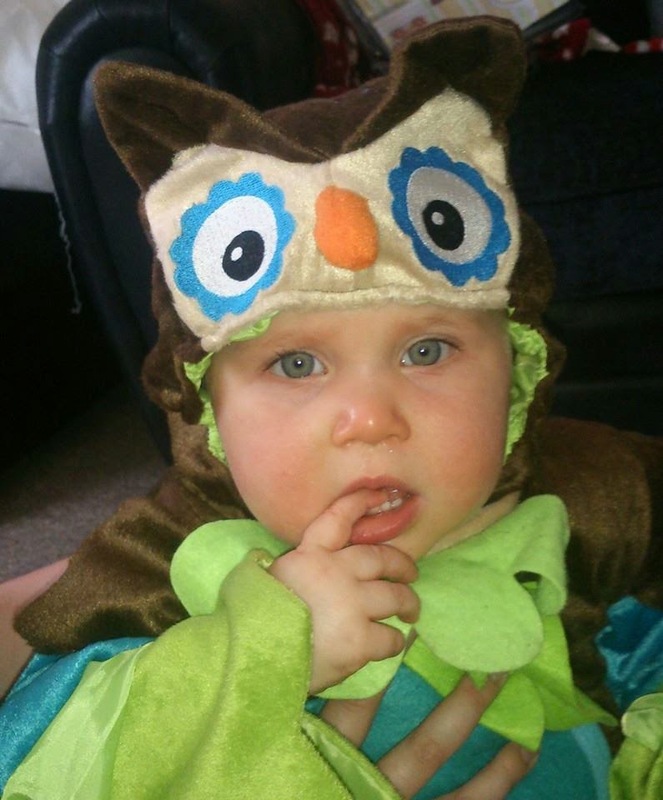 The owl costume is made up of a bodysuit with is fastened with a zip and several poppers. It features open feet and hands and is fully lined. It features different shades of blue and green "ruffles" around the neckline as arms to look like owl feathers. There are also 2 orange "feet" which again are lined and are simply slipped on to the feet like shoes. There there is the head piece which is worn like a hat and it fastens under the chin with a simple velcro strap. All pieces are fully lined and really high quality! I really liked the face the body suit part of the costume was fastened with a zip to the back making it easy to get on and off, but it also had poppers around the leg meaning I didn't need to remove the whole costume for a quick nappy change. Another bonus with this costume is that it is machine washable which is almost essential I find with childrens, especially babies clothing as Evelyn is forever spilling food/drink on herself! Look how cute she looks! The only small issue we had was that the feet didn't seem to stay on very well as Evelyn isn't walking yet and as there is no strap to hold the feet on, just an elasticated band around the ankle they seemed to slip off. Im sure this wouldn't have been an issue if Evelyn was walking and the feet do feature a non slip sole so that babies can walk around without slipping in them. The sizes do come up quite large so if you are thinking of ordering I would definitely say order the size of clothing your child is wearing now and you will get plenty of use out of the costume! As well as the high quality costumes Time to dress up also offer a range of accessories such as capes, tutus and wands for all our your dressing up needs. They also offer FREE delivery on all orders over £30. You can check out their full range via the website here - timetodressup.co.uk. Do you ever dress your baby or child up? Whats your favourite costume from the time to dress up website?